SCAN Geophysical ASA (SCAN) today announced that it has signed an agreement with V.Ships Management Limited for marine management of SCAN's three newbuild high capacity 3D streamer vessels, due to be launched in 2008. The agreement, which calls for V.Ships to manage the SCAN vessels for 10 years, was entered into in connection with the closing of a recently announced sale lease-back transaction with Ship Finance International Ltd. on bare boat basis. On order at India's ABG Shipyard, SCAN's new vessels are purpose built and specifically designed for efficient 3D seismic acquisition with high streamer capacity of 10 tow points and streamer lengths of up to 10 km (applies for up to 8 streamers), corresponding to a total capacity of 80 km streamers. V.Ships, the world's largest provider of ship management services, manages a fleet of more than 900 vessels encompassing most ship types, including a considerable number of vessels owned by Ship Finance. "We are very pleased to have one of the most experienced ship managers to operate SCAN's state-ofthe- art vessels. With V.Ship's extensive experience with the oil and gas industry, they comply with SCAN's strict requirements for QHSE," commented Lars Johan Frigstad, President and CEO of SCAN. "With its network and offices worldwide, V.Ships will be able to operate our vessels in a most efficient way as well as provide high-quality marine crew, securing SCAN's efficient production together with SCAN's experienced seismic crew," added Frigstad. SCAN Geophysical ASA was established in 2002 as a Norwegian seismic data acquisition company specializing in both marine streamer seismic and ocean bottom seismic. 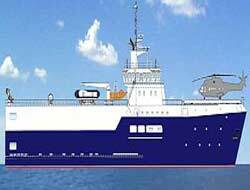 The company is currently operating one 2D and one 3D vessel, and will soon launch one 2002 built 3D vessel and three newbuilding state-of-the-art 3D 8-10 streamer vessels.